Last month my local genealogy society (Marin County Genealogical Society) held our annual workshop meeting. One of the topics presented was Using Social Media To Further Your Genealogy Research. I want to follow-up what our members learned by sharing a success story about how social media has aided my research. Several years ago, while working on my father’s Italian line, I sent a message to a woman using the messaging service on Ancestry.com. This woman (I will refer to her as Minnie for privacy) was the owner of a family tree which included a person who was listed above my family member on the passenger manifest for the trip from Italy. What caught my eye and made me contact Minnie is both men were from the same very small town in Italy. Minnie and I have not found a link to prove a relation between us but it is still possible since there are only about 12 surnames in this town. Since our initial emails, we have helped each other with our research. I found and sent digital copies of church records to Minnie. When she visited Italy a couple of years ago, Minnie sent me a book about Cossano Canavese which includes a photo of my great-great-grandfather. More importantly, Minnie and I became Facebook friends. As part of her trip to Italy, Minnie became friends with several of the people she met in Cossano. Minnie friended her Italian friends on Facebook as a way to stay in touch. Minnie also suggested to me that I friend one of the women (I will refer to her as Lily for privacy) as she had a lot of knowledge of the town and its history. At the time I friended Lily we exchanged a couple of messages about who we were related to and our interests. I have enjoyed seeing the photos of Cossano that Lily posts to her Facebook account. Last month, I was reviewing my research and realized that while I had supporting documents for my Italian line to 1899 (when the microfilm ended) I was missing a few critical items from 1900-1921. I sent a message to Lily to ask her what was the best way to get the documents. Who should I contact and what do I need to say? Does it have to be in Italian? I included in my message that I was looking for the marriage of my great grandparents, baptism of my grandfather, and death records for both great grandparents. Two days later, I had a message back from Lily. She had walked down to the church in town and had taken photographs of all the documents!! She also informed me that the current vice-mayor is one of my relatives who remembers my grandfather. I have the contact email for her and Facebook information for her son. If I had not reached out to other family history researchers and created relationships using social media I would not have these special documents right now. I now have a copy of both of my grandparents signatures and more of the story of how my grandfather came to the U.S. has been filled in. I also have started new relationships with distant cousins in Italy. Social media lets you connect and collaborate with other researchers and distant family. You never know how those connections may lead you to a piece of the missing genealogy puzzle! On Monday, Memorial Day, I got lucky and had a few hours of quiet time as the kids played down the street. I took the time to watch a webinar Dear Myrtle did with her Cousin Russ a couple of weeks ago titled “Information Overload.” The webinar was about how Cousin Russ is approaching the huge job of looking at all of his shaky leaf hints on Ancestry.com. He found that if he looked at the records for each person it was a slow process. He took a new approach and started tackling the hints by dataset. With this method, he researches what each dataset is and then creates a template citation for the dataset. This way when he looks at the hints he only has to change certain parts of the template not write a new citation each time. A flow is created and things move faster. I decided to try the concept out. I remembered that Randy Seaver had written a blogpost about how to look at record hints by dataset. I did a quick search and found the blogpost here. Each ancestry tree has its own number and each dataset has its own number. Randy has a URL you can put in your web browser that will use both of the numbers and magic happens to create a list of hints for a specific dataset. I decided to look at all of my FindAGrave shaky leaf hints. I created a citation template in notepad and went to work. Some of the hints were gravestone’s I had already identified so they were quickly confirmed. I was able to update death dates for about 75 people Monday night. Each gravestone photo was downloaded to my computer, metadata added to the photo, information and citation added to Family Tree Maker, and hint confirmed. It was great to clean up a bunch of missing information in my database. I was surprised how well this work process worked. It was very efficient. I do not plan on tackling all of my ancestry hints at this time. I may take a look at a specific database every now and then though. As always, there is already a long to-do list to work on and paperwork to catch up on. If you read my blog, you know that I am a big believer in buying presents for myself for Christmas and my birthday. This year for my birthday I gave myself a day of genealogy education. This past Saturday I attended the San Mateo County Genealogical Society‘s Spring Seminar featuring Warren Bittner, CG. It was a great day which started by carpooling with friends from my own genealogy society. We were so busy talking, we ended up taking the scenic route because I got off at the wrong exit. Oops! We got to see some beautiful homes in Woodside and Menlo Park! We heard four lectures from Warren Bittner about complex evidence, immigrant ancestors, historical context, and illegitimacy. Warren Bittner is an excellent speaker. I was impressed how he easily wove together many complex documents into easy concepts. The most important concept I learned this weekend is to ANALYZE and COMPARE all documents relating to your research question. Warren Bittner’s case study about complex evidence used over twenty different documents. It was only when you compared the documents side by side that the many connections began to appear. We also learned how important it is to research the FAN Club (Friends and Neighbors) of your ancestor. I was impressed to see Warren Bittner use the FAN principle on the people buried in the same cemetery plot as his ancestor. It eventually led him to his ancestors in Germany. Overall it was a great day! I left with a sense of excitement to go re-evaluate some of my more difficult ancestors. I will start by getting out copies of all documents to analyze and compare them together to see what type of web of information I can create. I am a true believer in continuing education. It comes in all forms. I want to learn more about data sets I have not tried using and how to be a more proficient researcher. To accomplish this, I have spent two full days this Fall dedicated to learning more about genealogy research. This past Saturday, I spent the day listening to Judy Russell and learning a lot! 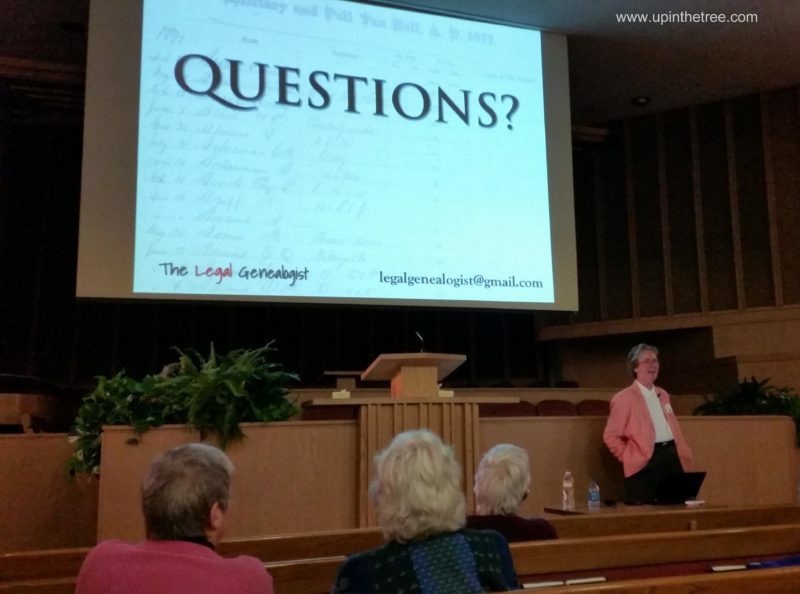 Judy Russell, The Legal Genealogist, was the featured speaker at the San Mateo Genealogical Society‘s Fall Seminar. She presented four topics during the day. The first one was Where There Is Or Isn’t A Will. I have many trips to the courthouse looking at probate records under my belt. I still walked away from this presentation with ideas about how to look for female death dates from the husband’s estate being reopened after her death. The second lecture, The Fair Court – Records of Chancery Courts, opened my eyes to a whole new data set. During the lunch hour I jumped onto my tablet and used a link for Virginia records that Judy Russell had recommended. I identified 198 hits for Chancery Court records for the surname Strickler in Page County, Virginia. I was so excited I introduced myself to Judy to tell her how thrilled I was and thank her for teaching me about these records. A closer look shows that one of the cases was the executors of my 4th great-grandfather’s estate suing the estate of his brother, my 4th great-uncle. The fight lasted 13 years in court. Then the daughters of my 4th great-grandfather sued their brother, who was one of the co-executors and my 3rd great grandfather, for not paying them part of their inheritance after the first case was settled. I will write more about these cases in the future. The afternoon sessions included Polls, Personalty, and Property – Making Sense of Tax Lists. This is a dataset that I have only dipped my toes into. After listening to Judy speak, I am ready to dive into the deep end and immerse myself in tax lists for as many ancestors as I can. 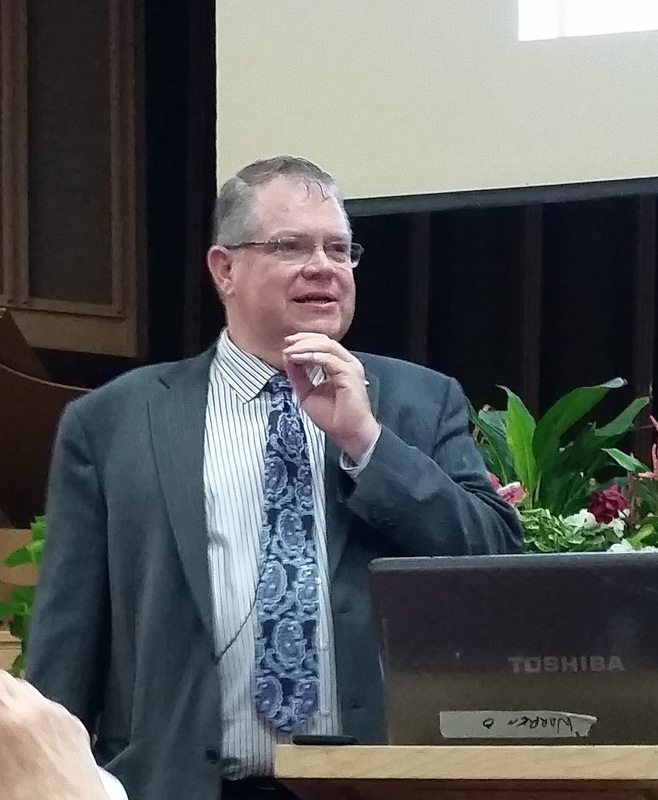 The last session was From Blackstone to the Statutes at Large – How Knowing the Law Makes Us Better Genealogists. My biggest take away was to understand the law WHEN and WHERE the record was created. During the session, I was scribbling down ideas about how to use this in relation to my ancestors. There are several places in my research I need to take a close look at the law to clarify what is the truth. If you have the chance to see Judy Russell present in person, I highly recommend it. Her excitement for all things genealogy and law is contagious. There is also a very good chance you will walk away learning something new. I also recommend, if you live in the Bay Area, to attend the Spring and Fall Seminars hosted by the San Mateo Genealogical Society. They do a great job of bringing in quality speakers and run a well-organized, fun day. I am so excited about the Marin County Genealogical Society meeting this month. We have Lisa Louise Cooke coming to present How to Reopen and Work a Genealogical Cold Case. Come join us on Wednesday, October 23rd at 7pm at the Marin Family History Center, 220 North San Pedro Road, San Rafael, CA. Our meetings are free to the public! Become a genealogical detective in this vital session. You’ll learn to track ancestors like a bloodhound, sniffing out holes in your research and getting missing information on the record. Lisa Louise Cooke is the owner of Genealogy Gems, a genealogy and family history multi-media company. 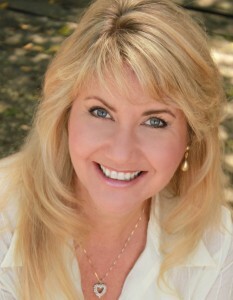 She is Producer and Host of the Genealogy Gems Podcast, the popular online genealogy audio show. She is an author, video publisher, and international conference speaker. She also writes for Family Tree Magazine, and is an instructor for Family Tree University. This week Chris Staats of Staats Genealogical Services posted a great blog post about a new way to look at brick walls. You can read ‘Genealogists Should Abandon the “Brick Wall” Metaphor’ here. The post discusses how when we run into a dead-end with research, it is more like building a brick wall then running into it. I really like this post because it puts a positive spin on troublesome ancestors who just do not want to be found. I believe that you will definitely get further when researching your ancestors if you start with a confident upbeat attitude. This post appeared last weekend just as I was working in the front yard on a project. I was removing dirt from a flower bed and knocking down the brick retaining wall. For me it was all about proper drainage away from the foundation. 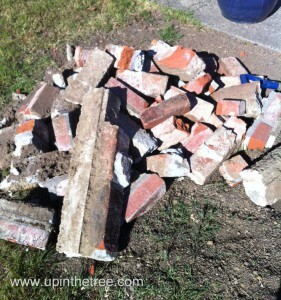 As I was swinging away at the bricks with a sledge-hammer, all I could think about was genealogy. While it was fun to break down a brick wall, I would much rather do the hard work to build a proper one. Thank you to Chris Staats for a new perspective at some of my more difficult ancestors! My father is in the process of retiring. He has worked over forty years in the naval industry. The first thirty years were spent in the Coast Guard. After retiring from his military career, he took a civilian job building ships. That is a very stripped down explanation of what he does but it would take a long blog post to cover all of the facets of his job. While my Dad was here visiting last week, he had a great tip. I should go save the business profile of him listed on his company’s website. I did just that! The biography lists some of his work accomplishments, schooling, awards, and prior companies he has worked at. It also contains a somewhat recent photo of him. The way I saved the profile was to use the snipping tool in Microsoft Windows. I then saved the digital image to my computer. 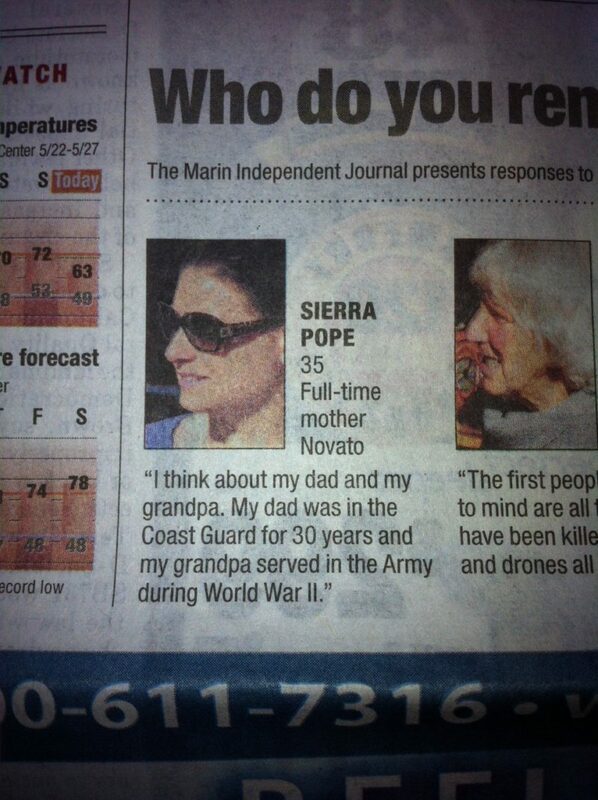 I think this profile will be a valuable piece of my Dad’s story to pass on to my descendants. My suggestion is to save any online profiles or biographies you may have of living relatives to add to their story for future geneations. A couple of weeks ago I was interviewed by a reporter on the street. 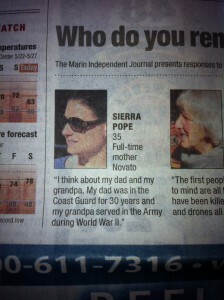 It was for a section the newspaper does where they ask five locals a question and print the responses. I was asked “Who do you remember or honor on Memorial Day?” While I spoke of my father and grandfather, the other respondents were not so patriotic. There was a lot of discussion of the article in the letters to the editor section everyday in the week after the article ran. It occurred to me that in my research I have never checked the letters to the editor or opinion pieces before. I wonder what I have missed! This is definitely something I am adding to my mental checklist. When I find articles about my ancestors in the future, I will be sure to check the letters to the editor section for the next couple of days after the article appears. It might result in nothing or it might add more to a story! 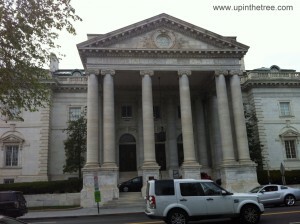 I mentioned briefly last week that I recently got the chance to visit the Daughters of the American Revolution Library. I am not a DAR member but I wanted to see what I could find in the library. It turns out that I found enough to become a member on a least one branch of my family that day. View of building from west side of the Ellipse. 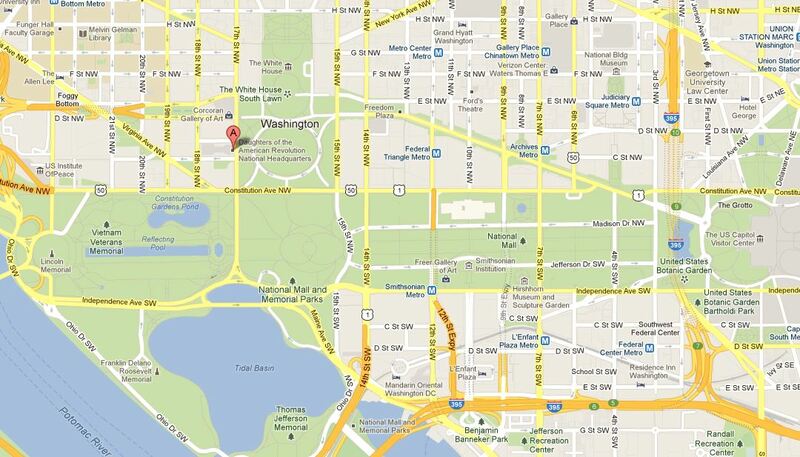 The library sits about a block south of the White House and just west of the Ellipse in Washington, D.C. 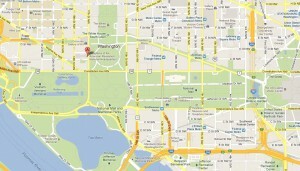 This Google map gives you an idea of where the DAR headquarters are in relation to the monuments and National Mall. I chose to take the Metro in from Northern Virginia to avoid parking issues. The Federal Triangle Metro station lets you out on the other side of the ellipse. After going through a quick security check at the building entrance, I made my way to the library itself. I checked in with the reference librarian at the front desk and then attacked the numerous shelves of books. I had done my homework before arriving by extensively searching the online library catalog. I highly suggest this because the library contains over 150,000 volumes. There are computers next to the reference desk if you need to use the catalog. The shelves in the main room are organized by state and county. There are also shelves with books about families listed alphabetically and some shelves with general history books. There are copy machines located at the front of the room. Personal scanners and cameras are not allowed for copying books. You may take photos of the room in general though. I am sorry that I did not take time to get better photos. This shot was taken on the spur of the moment as I picked books out from some of the stacks upstairs. There is an absolutely stunning photo of the library at www.dar.org. Taken from upstairs looking down at the library tables. Half of the tables are missing because there was construction on the glass ceiling above that area. The Seimes Technology Center is located down the hall from the main library. One of the books I was looking for was located here. There are many computers set up in the room. Each one is numbered so if you print pages, the reference librarian will be able to get them to you. The book I was looking for had been digitized so I got to read it on the computer screen. I was impressed how fast the images loaded. There was no wait time for the images to load so you could move though a book quickly. 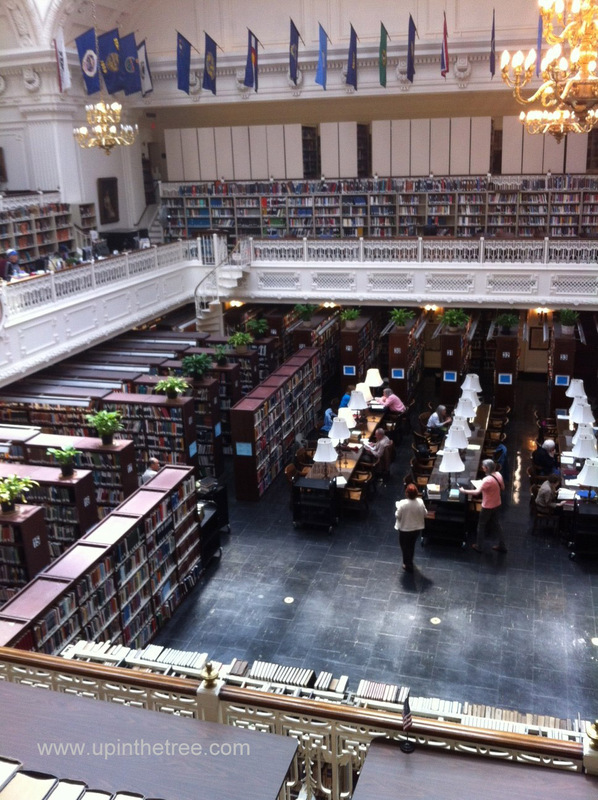 I cannot say enough about the reference librarians I met on my trip to the library. I believe that they rotated into the reference desk about every hour or hour and a half. I spoke with almost all of them. Every person was so knowledgable and friendly. In fact, the librarian who was assisting me in the Seimes Technology Center noticed a book mentioned in one of my page prints. She highly recommended that I return to the library and find it. It turned out to be my biggest find of the day! I will tell you all about my genealogy jackpot in another post. If you have the chance to research your family history while in Washington, D.C. don’t forget to check out the DAR Library. It is an amazing resource!